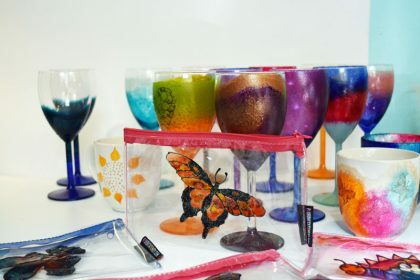 Learn how to create a stunning and colourful frosted effect on wine glasses, using ceramic and porcelaine bakeable paints and a sponge. We’d rather you spent your time creating than watching videos so it really is a QUICK video. Ceramic or glass paints, water, a sponge, a brush, masking tape, wine glasses and an oven. Learn a simple way to apply bake able paints to class. Learn how to have fun with colour QUICKLY! Learn a few tips and techniques. Suitable for most of the family to do. Learn how to make stunning gifts for your nearest and dearest. You can use this technique on plates, mugs, bowls, teapots and more. From age 3 upwards, with adult supervision.